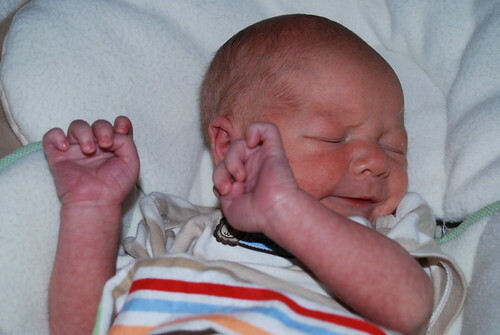 So in the mad chaos of leaving the hospital Friday we didn't get a lot of pictures. That morning Landree and Momma came up and Landree and Jeff left for her preschool orientation while Momma, Hudson, and I hung out getting all of our 'instructions' and discharge info. Then there was the sweetest little volunteer, who was quite literally 100, that pushed me out in the wheel chair. She would not let me walk. Hudson started crying. Landree started crying because she said Hudson didn't want to be in his seat. We had to wait to have our bracelets cut off. You get the picture. 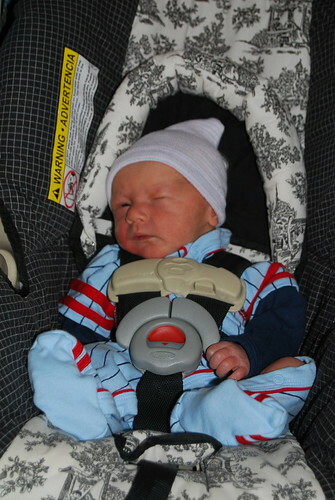 But here is our little man leaving the hospital in his car seat. And a few more sweet shots from the last few days. Our first night home was pretty rough, but we've had a great night the last two nights just getting up to eat and change his diaper and then back to bed. We've all had a cold-starting with Landree and I. Now poor Hudson is congested. We go for his first doctors visit tomorrow. And Landree has her first day of preschool. Busy, busy, I can't believe we have two kids!!! 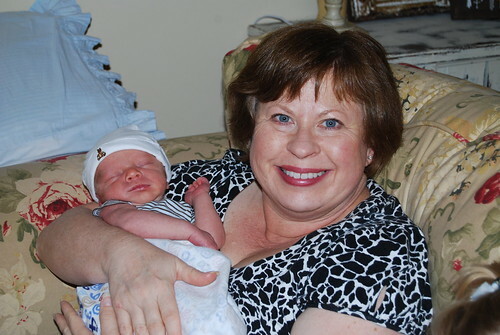 Thank goodness my mom has been here helping us-I don't know how we would be surviving without her help! There certainly wouldn't be any time for blogging! He's such a doll!!! Enjoy your time with your mom being there!!! Glad you all are home and doing well! He is beautiful! 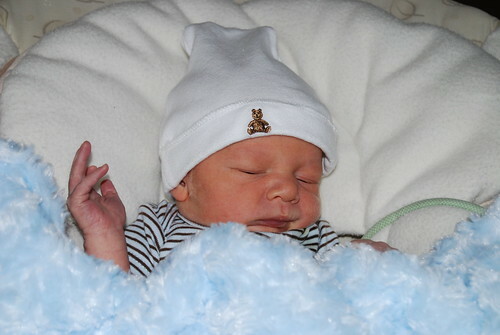 Congratulations...Hudson is adorable! I hope you all feel better soon...I'm sick too! Awwww.....he is just precious!! Glad to hear you have your Mom there to help out......two is much different than one, isn't it? Hope you all are feeling better soon....and hope that first baby visit goes well too!! Yep, I'm in love. I don't know how I will ever be able to wait until December to get my hands on this lil guy! 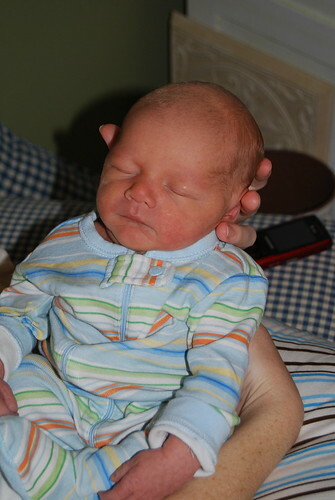 I am so thankful your mom is there...I am amazed at this precious gift....he is so precious. Hudson is just adorable! Life is soooo much busier with two kids. I am so glad your Mom is there to help! So sweet! And...he has a TAN! Hope ya'll get to feeling better soon! He is so adorable!! I am sure you are so busy, I can only imagine! He is just precious! Hope you guys are feeling better. Life definately changes with two, it's exactly double the work! This is definately why I hardly get to blog anymore these days! Good luck at the doc!